1. March 2016. Database content was just updated with 202 new material datasets - majority of which are steels. Index of new content is already submitted to Thomson Reuters for inclusion in DCI. 8. April 2014. Talum Inštitut d.o.o., material research and environmental protection, invites laboratories to take part in proficiency testing for AlSi9Cu3 alloy (226a quality) by method of optical emission spectrometry in accordance with EN 14726, which will be carried out in May 2014. MATDAT.COM has partnered with eFatigue! During "Ph.D. summer school on Multiaxial fatigue of engineering materials and components" organized by IGF (Gruppo Italiano Frattura) we have met with prof. Darrell F. Socie (University of Illinois at Urbana-Champaign, U.S.), founder of eFatigue.com. eFatigue offers fatigue calculators, material databases, stress concentration factors, training, consulting. Weblinks are already exchanged between eFatigue and MATDAT.COM and initial steps are taken towards integrating our material properties database with calculators offered at eFatigue. More good news! 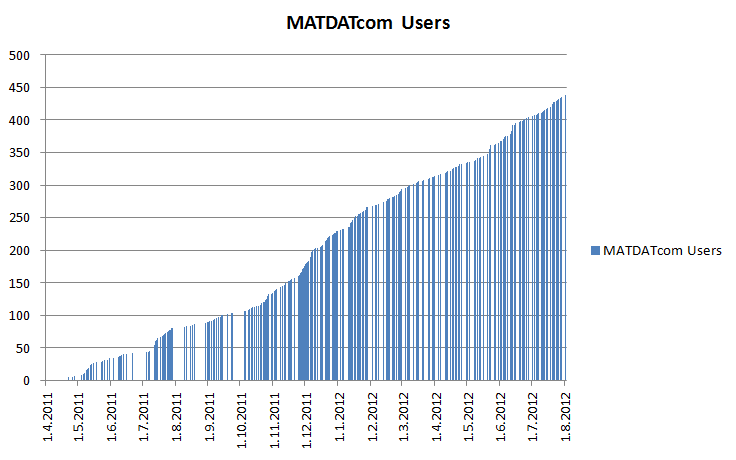 Over 400 registered users at MATDATcom! During Tuesday and Wednesday, our website was attacked. Visitors informed us that upon the visit, they were redirected to other sites and/or were unable to acces our website. Our developers and hosting providers took care of the problem and now situation should be normal as usual. We apologize to all visitors and users that experienced problems during last two days. Invited speaker Prof. Socie is Professor Emeritus at the Department of Mechanical and Industrial Engineering, UIUC since 2004. Professor, Department of Mechanical and Industrial Engineering, UIUC, 1985-2004. At the end of the course, a presentation of the MATDAT.com project and the website/database content was given to the attendants by the project leader, Assist. Prof. Basan Robert. In the framework of MATDAT.com project, one doctoral dissertation is being prepared. Advanced methodology and system for estimation of cyclic and fatigue material parameters will be developed. Evolutionary methods (genetic algorithm, genetic programming, neural networks) will be used and once available, results will be implemented in MATDAT.com system. Intensive updating of the website in the next couple of days! Due to the time-consuming efforts and activities on acquiring financial means for further development of MATDAT.com, updating and expanding site content was neglected in the last couple of months. Large number of project and database presentations were given at the number of companies and faculties and most prominent result is that we have signed a two-year contract with the Mechanical Engineering Faculty in Slavonski Brod. This enables us to focus on updating and expanding the general content of the website. Expect a number of additions both to the general content and to the Dashboard section. Joanneum racing Formula Student team July 2012 Newsletter is out! Congratulations to the Joanneum Racing team and good luck at the upcoming racing events! First faculty user of MATDAT.COM! MATDAT.com signed 2-year contract (MATDAT Campus license) with Faculty of Mechanical Engineering in Slavonski Brod, Croatia. MATDAT EDU licenses are secured for all students of the Faculty, while full access is available to all academic staff through corresponding MATDAT PRO user accounts. 3rd Fatigue Conference in Leoben, Austria is on! We are there! LinkedIn Company page is up! From 21.11. to 24.11. MATDAT.COM initiative was presented at FH Joanneum, Graz and Montanuniversität Leoben (Austria). Assist. Prof. Basan Robert, Prof. D. Sc. Rubeša Domagoj and doctoral student Marohnić Tea visited FH Joanneum where MATDAT.COM was presented to Fachhochschule staff and to Formula Student Racing teams of FH Joanneum and Technical University in Graz. At Montanuniversität Leoben, Department of Product Engineering (at Lehrstuhl für Allgemeinen Maschinenbau) meeting and presentation of current and future was hosted by Dr. mont. Michael Stoschka. Potential cooperation was discussed and already valuable new material data on magnesium alloys are being prepared for inclusion in MATDAT.COM database. 26. October 2011. Invited lecture titled "Estimators of fatigue material properties" was held by Assist. prof. Basan Robert at the WCFA´11 meeting in Prague, Czech Republic. Please read this and consider supporting MATDAT.COM - Thank you! Main motivation for starting the MATDAT.COM project was the idea to organize material data which I obtained from literature/experiments during work on my thesis, and to make them available to other members of the technical community and to help them save their time, money and effort. All material data included in the database are from relevant, well-documented sources (journal and conference articles, dissertations, technical reports, handbooks). As this information is already published, and since I wanted to make a contribution to the community, I have decided to keep basic access to ALL THE DATA in MATDAT.COM database COMPLETELY FREE to students and young researchers through MATDAT EDU option. MATDAT.COM is a result of much enthusiasm and countless hours of research and hard work - and all of this without any external financial support. If you feel that efforts behind MATDAT.COM are worthwhile and find provided data/information to be useful, please consider supporting us in more substantial manner. You can do so either by registering as a MATDAT PRO user (click here for more details on options and advantages), or if you are representing a company, by sponsoring our project (contact us directly for more details and sponsor plans/options). I would also greatly appreciate you spreading the information about MATDAT.COM among your colleagues and partners as well as putting the link to MATDAT.COM onto your website. In the name of MATDAT.COM team, I thank you in advance for your support! Assist. Prof. Basan Robert, D. Sc. * Please note that Comparison reports (up to 5 materials) are available to MATDAT PRO users only. Boller, C., Seeger, T.: Materials data for cyclic loading – Part A-E, Elsevier, Amsterdam, 1987. Bäumel, A., Seeger, T.: Materials data for cyclic loading – Supplement 1, Elsevier, Amsterdam, 1990. For such a huge and significant contribution to the development of MATDAT.COM, partnership and cooperation with Institut für Stahlbau und Werkstoffmechanik, TU Darmstadt was proposed to Prof. Dr.-Ing. Vormwald Michael. Additional meeting at ICM11 Conference (June 2011) between Assist. Prof. Basan Robert (leader of the MATDAT.COM project) and Prof. Dr.-Ing. Vormwald Michael (head of Fachgebiet Werkstoffmechanik at the Institut für Stahlbau und Werkstoffmechanik, TU Darmstadt) resulted in agreement to combine the efforts and expertise in research of material behaviour and further development of MATDAT.COM. Already this new cooperation resulted in joint application for bilateral Croatian-German project titled "Characterisation and modelling of material behaviour for more efficient and lighter designs". Results will be known in December, 2011. and we are keeping our fingers crossed! Paper titled "Implementation of strain-life fatigue parameters estimation methods in a web-based system" authored by: Robert Basan, Marina Franulović, Domagoj Rubeša (Faculty of Engineering, University of Rijeka, Croatia) and Ivan Prebil (Faculty of Mechanical Engineering, University of Ljubljana, Slovenia) was presented at the ICM11 Conference on the mechanical behavior of Materials. The ICM holds international conferences every four years. These conferences are intended to cover progress on all aspects of the mechanical behavior of materials from both the macroscopic and microscopic viewpoints. The scope of materials of interest include both industrial materials, e.g., metals, alloys, polymers, ceramics, composites, and advanced materials under development or used in particular applications. ICM11 Conference was held 5.-9. June 2011 in lovely Como, Italy and was organized by Politecnico di Milano and Prof. Mario Guagliano acting as a Chairman of the Conference. You can find abstract as well as the link to the fulltext of the paper published in Procedia Engineering Journal, in our Knowledge base section. Presentation of MATDAT.COM system and demonstration features implemented sofar was held on Thursday, 12.05.2011 for members of the Chair of Modelling in Engineering Sciences and Medicine at the Faculty of Mechanical Engineering, University of Ljubljana, Slovenia. Another set of material data is added to our database. Currently, there are total of 833 datasets in the database at the moment. We expect to pass 1000 datasets in the next couple of days. Register and search our database! Currently, there are 476 datasets in the database (unalloyed, low alloy and high alloy steels). New datasets (aluminium and titanium alloys) are being double-checked and will be added shortly. Brief presentation of the project concept and initial results was held on Tuesday, 25.01.2011. for members of the Department for Mechanical Engineering Design at the Faculty of Engineering, University of Rijeka. Underlying idea and basic concepts were explained to the audience followed by brief overview of previous activities and up-to-date implementation of the webpage and materials database. Lidija Runko Luttenberger, D. Sc. Some twenty plus years ago I was writing my master’s thesis entitled “Contribution to practical determining of corrosion fatigue of steel with particular reference to offshore technology units”. My paper among other things contains fatigue and corrosion fatigue test results for microalloyed steel TStE355 FG36T. I would just like to reflect on how much effort and material resources I had to engage in order to provide high-quality specimens appropriate for low-cycle fatigue tests and to obtain relevant results at the prestigious institute. I had to involve a number of people in two major Croatian shipyards for procuring, cutting and machining the specimens in the yards’ tools processing workshops and to do much travelling in order to attend the tests. On top of that, it was quite an undertaking to find the literature in the field at the time. I am not sure that much has changed since then so I welcome your initiative to institute a web page containing a collection of scientifically and professionally relevant test results regarding different materials. I am sure it will spare many the effort of undergoing the lengthy, demanding and expensive procedures of determining advanced characteristics of industrial materials. We welcome all ideas and cooperation proposals as well as any larger number of material datasets which you might be willing to contribute. At AITAC, we believe that providing you final 3D models and drawings is not enough. We value a strong relationship with our customers. We listen and help you achieve your project, bringing you our experience and efficiency. From engineering one of the largest yachts in the world to developing PLM solutions for shipyards, AITAC can provide the support you need. No matter how complex your project might look, we will turn it into reality.